When we speak of consciousness we are referring to the sum total of events in awareness. The term by no means exhausts the realm of things psychological, but it does encompass all of an individual’s direct experience. 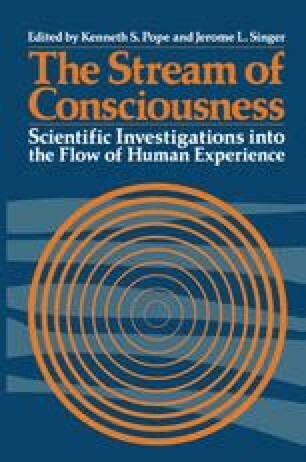 When we speak of the flow of consciousness we are referring to the changes that take place in consciousness over time. The events of consciousness are, of course, extremely complex and varied. They embrace images in every sensory modality and in every degree of vividness, realism, and believability, including inner dialogue, hallucinations, reveries, and dreamlike sequences; and they also embrace qualities that are at the same time less figured and more pervasive than these—the affects. This chapter focuses on a broad class of these conscious contents. They do not contain the imagery of current perceptual activity but they contain imaginai qualities that one can describe in terms of forms, colors, sounds, words, smells, tastes, temperatures, and the like. I shall refer to this class as ”thought.” This chapter brings together ideas and data regarding ways to observe thought, the dimensions and forms of thought, and the factors that determine the content of thought as it changes from one moment to the next. The research was supported by Grant No. 1-RO1-MH 24884 from the National Institute of Mental Health. Essential pilot studies not reported here were made possible by grants-in-aid from the University of Minnesota Graduate School.